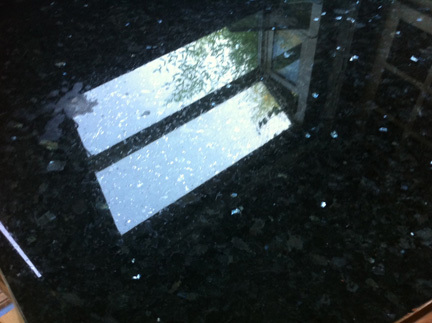 See how the dark reflective countertop captures the outdoors and brings it in? And the aliveness the scattered iridescent bits create? 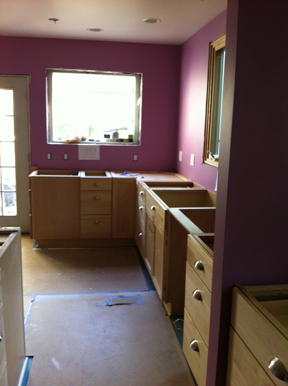 The countertops went in yesterday and lived up to my inner hype! The name of the granite is Emerald Pearl, it’s deep black with scatterings of iridescent chips that have a hint of blue/green silver. It makes for a striking contrast with the other colors and the darkness actually pulls in light. A rather counterintuitive countertop. As you can see above, the surface is very reflective. That was planned, because it marries all the room colors together. The marriage will not be fully consummated, however, until the backsplash tile is installed. That means there’s more wow to come! 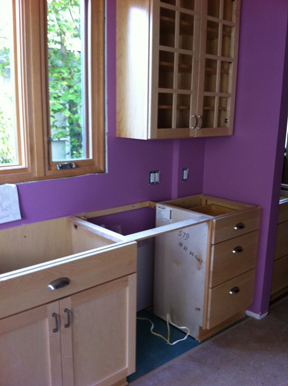 Please overlook the tools, random cardboard and funky piece of wood as you get a look at our counterintuitive countertops. The countertop choice also brings the outdoors inside and means the kitchen is never twice the same, as outdoor light is ever changing. 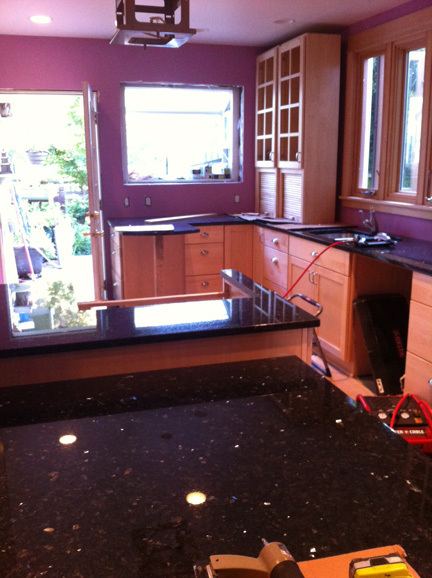 Do you realize that this countertop will even lasso the moon? When all the house lights are out, we can watch the moon move across the counters as across the sky. If we can stay up that late, I mean. We did have a snafu (if you haven’t ever looked up what that stands for, you should do it now) with the countertop, however. Somehow the installers didn’t install the steel supports for the small table (more like a tablette) I planned to accommodate two barstools, so they left a funky piece of wood supporting it. Didn’t exactly fit in with the overall look and feel. HOMEINSPECTORHULK NOT APPROVE. SMASH WITH FIST AND DO HULKSULK. Corrections will be made. Not exactly sure what or how or when at this point, but as Paul said, it’s not our problem, except for the inconvenience and putting us behind our schedule that was still actually on track. We are keeping the faith, staying mellow and going with the flow. If you look really closely at the photo below, you’ll see that Ric has already hung his purple guitar on the wall so we might actually be singing Cumbaya before long. 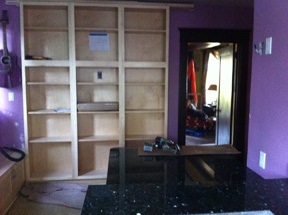 Looking north at the granite tabletop, bookshelves and purple guitar.